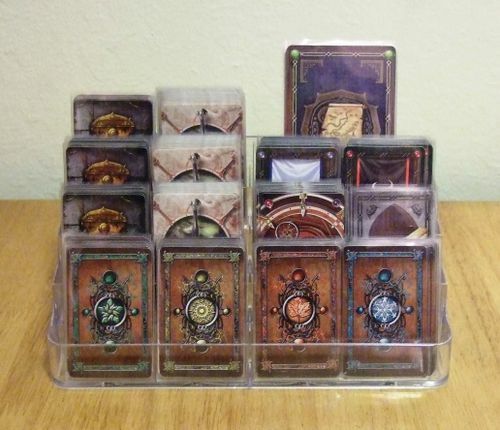 Business card holders (especially the 8-tier ones like the following) provide a good way to organize decks of cards or reference cards. 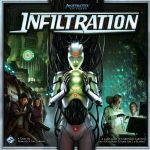 Post any ideas you have to improve game experience. 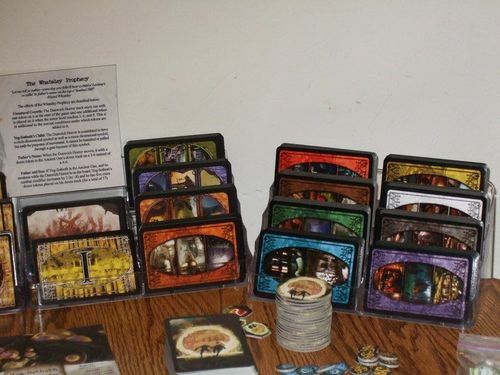 The moment my Monster reference cards fit perfectly onto my two 8-pocket holders, I was sold on these holders forever! 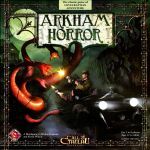 For the uninitiated, the game at times involves fighting one of Sauron's Monsters, whom you need to fish the specific card for out of the Monster deck. Set it up beforehand though, with the Monsters sorted alphabetically, and you can easily grab the Balrog, then place him back in the right place when his moment is over. There are 8 Strategy Cards ('Roles' in Puerto Rico), 1 for each pocket. 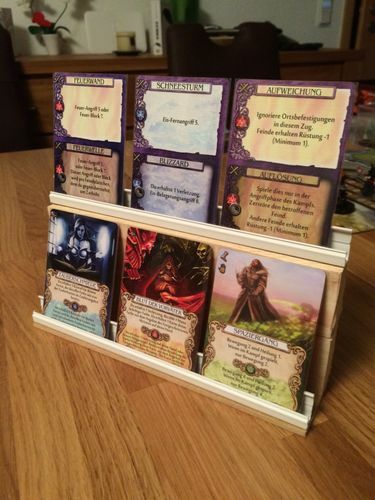 When it's somebody's turn to choose a Strategy Card, simply give him the entire holder so he can read them and decide. 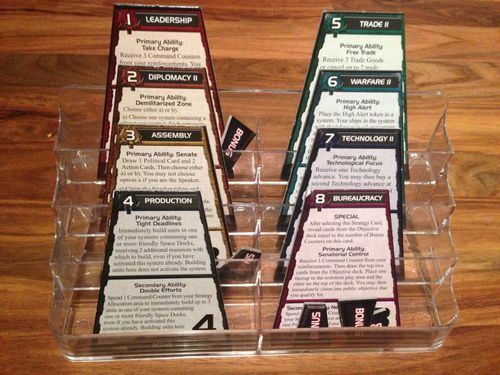 When Strategy Cards accumulate Command tokens, simply place them into the same holder to show whoever picks that next also gets the Command tokens. 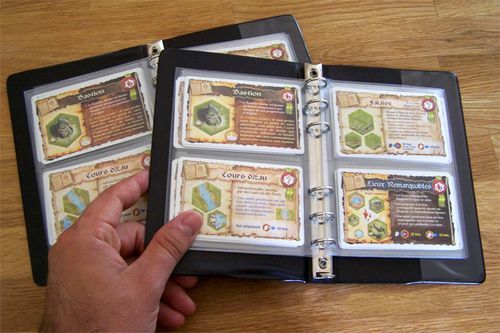 Also usable for Puerto Rico and Terra Mystica. ajax013's brilliant idea to save the large chunk of space the Skill Cards take up, plus make the Draw Steps go quicker (just give the entire rack to the player whose turn it is). I also use 1-pocket business card holders to hold everything the President, Admiral (and Zarek) need, so they can have it by their side. If (When) the title changes hands, simply give the card holder to the new President/Admiral instead of dealing with the fiddly-ness. 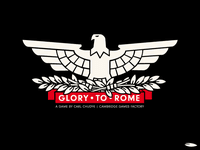 This is the game that provided the impetus for business card holders. 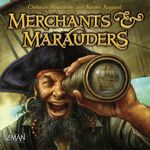 I liked it, but there were so many cards and tokens strewn all over the place that it bothered the heck out of me the first couple times we played. 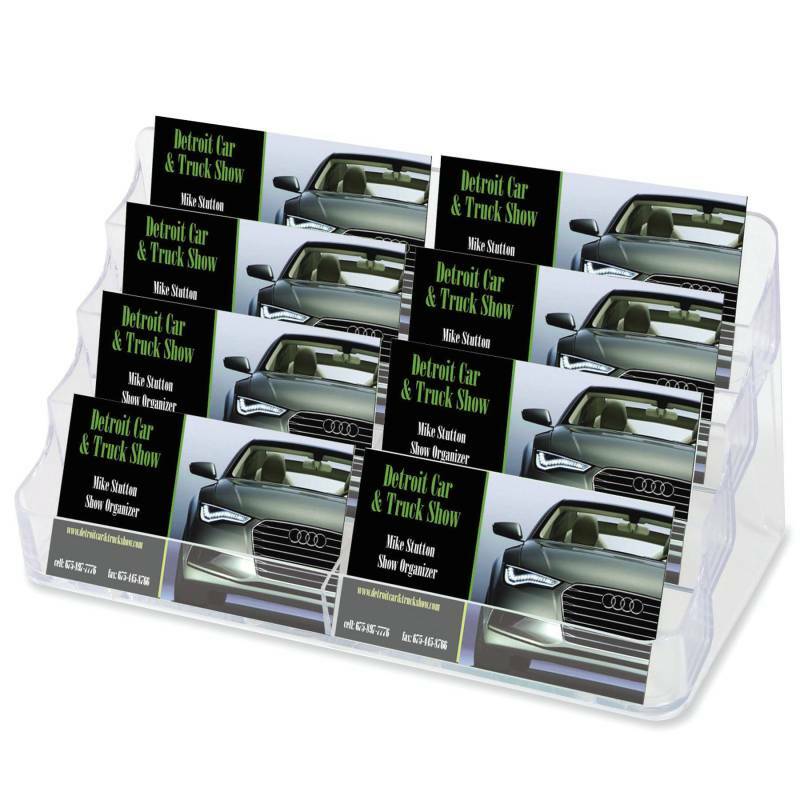 Business card holders keep things organized. I prefer to use a single-pocket holder to hold the Fate Deck, which you can give to whichever 2 players are resolving a battle right now. 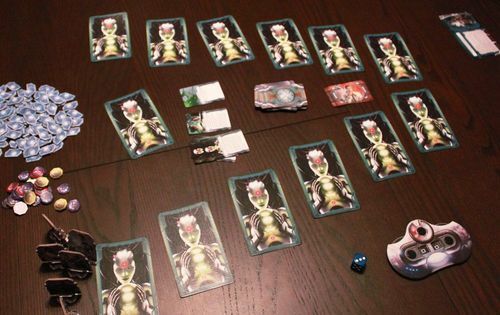 Having Fate Cards strewn lazily around the board is a Runewars owner's worst nightmare! GtR takes up a lot of table space with the player mats, Pool, tableau etc, so save some space by having the building sites go into the 3rd dimension. 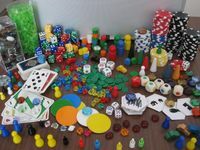 Can also use a separate holder to sort cards by color in the Pool since that is always the messiest part of the table. 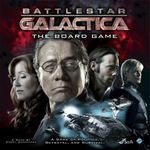 Game already takes up plenty of space, so outsource the little-used decks of cards (especially Ships and Captains, which only matter a few times in a game) to the 3rd dimension. In this case, I put in Active Missions, so interested players can grab the whole rack instead of bobbing their heads on top of the board when I'm trying to reach across. 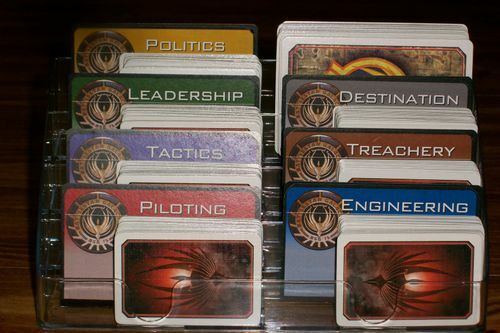 As you can see, also using a single-pocket business card holder to store Cargo Cards. Simply hand the thing over when somebody is performing a Merchant Raid/Location Raid or buying goods. 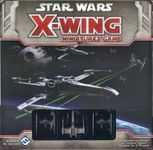 Anything with reference cards is ideal for business card holders, and X-Wing has A LOT of them. I printed out these handy Maneuver Reference Cards to occupy another two racks. Each player gets a rack. 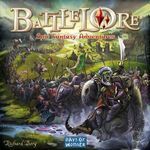 I see images like this that cram BattleLore's excellent thoughtful reference cards (2 copies of each so both players get a set!) 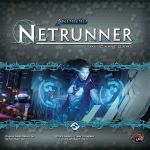 into a CCG binder. I don't like it, the whole point of a reference is to have everything laid out in an easy-to-follow 1-page reference, not flipping pages to look for what I need. Therefore, I prefer business card holders for this purpose. 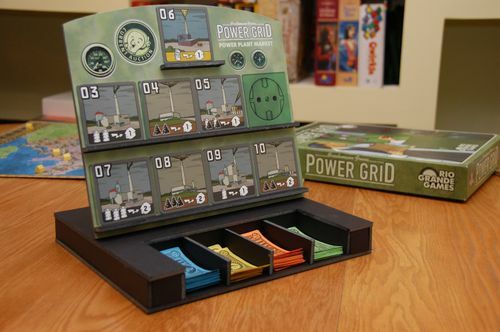 This is even more useful for Memoir '44 and Memoir '44: Air Pack, where you only get one set of reference cards, so players can pass the business card holder back and forth, instead of passing individual cards or walking over to the other side of the table. 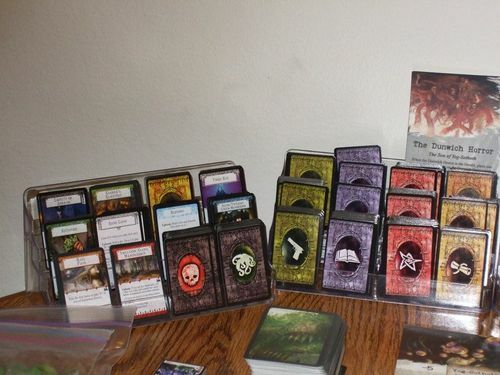 He also uses business card holders to store Investigators + their starting items (in preparation for dead players who need a replacement Investigator) for Mansions of Madness, which was the first time in real life that I saw business card holders in action. More experimental than really functional. Visual aplomb of the Runner climbing and encountering each piece of Ice to get to the remote server up top! 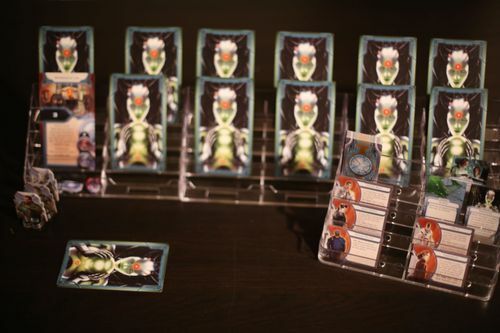 The Corp can more easily check his face-down cards. Drawback is advancement tokens are hard to see (have to move cards out of the way). 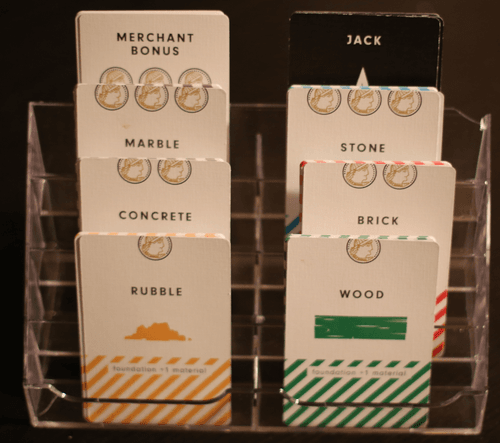 Common complaint is that the Room cards are hard to pick up on a flat surface (and especially if you stick tokens + characters on there), and there's no 3D feel to the first-floor, second-floor layout. Problem solved! Though tokens might be hard to see. Though this is custom-made , I expect you could use a regular holder to put the plants up for auction, so all the players can see what's for sale without squinting/standing. Place the Persistent Event tokens near the affected countries. 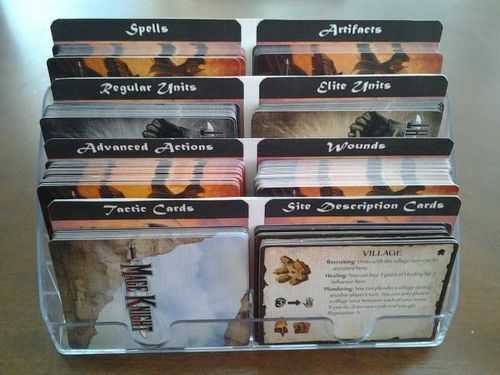 Then place the Persistent Events on a holder so both players can track and read through. 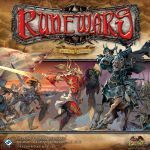 Mage Knight came to mind immediately, as it is a longish game with a big footprint. Sure enough, others have put biz card holders to use (or constructed something similar). I thought one would be enough, but seeing these, perhaps the game needs 2 - one for the draw piles and one for the offer. 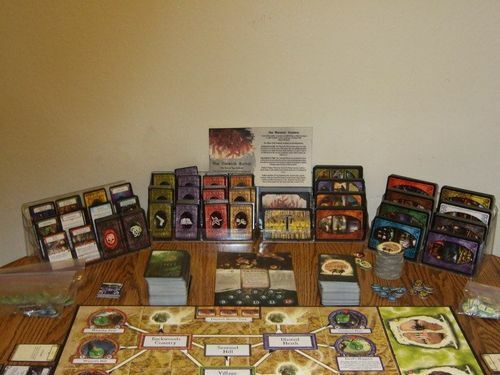 There are 12 decks of resource cards (think Settlers of Catan) and 1 deck of Tax cards. 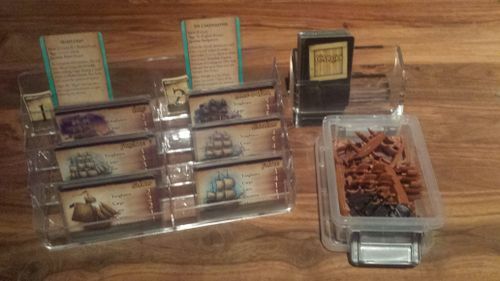 I put the resource cards in three 4-tier business card holders so they're easy to grab and put back, and the deck of Tax cards in a single-pocket business card holder. Will take a pic next time I break this out. 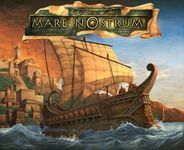 Possibly doesn't work with Mare Nostrum: Empires since they're doing something with counters now. Post your recommendations on which business card holder and where to purchase here.